On September 13th, 1940, a quarter of a million Italian troops under Marshal Rodolfo Graziani crossed the Libyan-Egyptian border and started an attack on the British troops in Egypt. Their objective: to push through the weak British defences and reach the Suez Canal, thus threatening one of the Empire's most vital links with its overseas colonies. The outcome of the war might well have been different had the Italian troops succeeded in their campaign - however, just as the attack began, Graziani began receiving disturbing news of attacks on his supply chains: depots were raided, airfields burned to the ground, convois attacked and captured, all well behind the frontline and from a direction he had thought to be completely safe - his southern flank, bordered by a sand sea thought to be impassible for vehicles and troops. The Italian offense halted, Graziani being uncertain how to deal with these unsuspected attacks that seemed to come out of nowhere, and the resulting break gave the British defenders all the time they needed to move in reinforcements and mount a counterattack. Unknown to Graziani, these raids were not carried out by large troop contingents but by a small group of desert experts formed only six weeks before - the Long Range Desert Group, at the time consisting of no more than a couple dozen men and a handful of re-fitted civilian trucks. This bold movement that was to tip the scales in the Allies' favor in one of the most decisive moments of the war was made possible by the vision of two men - General Sir Archibald Wavell, head of the British Middle East troops, who had masterminded this effective bluff, and Major Ralph Bagnold, a World War 1 Veteran who had spent the interwar years as a desert explorer and had a knowledge of the Libyan desert unmatched in his time. 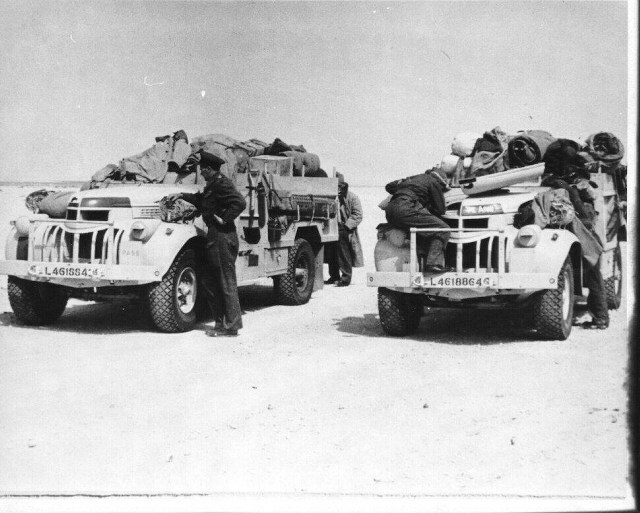 As the Italian offense drew near, Bagnold had quickly contacted his pre-war explorer buddies and -on Wavell's command- started to assemble a unit that could quickly move through desert terrain and strike at the enemy where he least expected it, using lightly armed and completely unarmored vehicles and operating completely self-sufficient, patrols being able to move through the desert for at least two weeks before resupplying. During the course of the African Campaign, the unit conducted various raids on Axis targets far behind enemy lines, thus constantly threatening the Axis' interior lines of comminucation and aggravating Rommel's already precarious supply situation. Of equally great importance was LRDG's intelligence work - patrols could supply HQ with detailed information on number, speed and direction of enemy troop movement, giving Allied operations a tactical edge that considerably helped fasten the defeat of Rommel's Afrika Korps. When in the battle of Alam Halfa Rommel's deputy, Wilhelm von Thoma, was captured, he was surprised to hear that Montgomery was better informed on German troop strengths and movements than he himself - information Montgomery had largely obtained from LRDG patrols. Just as the LRDG had won the day in the beginning of the African war, they also triggered the end of the campaign: in 1943, when General Freyberg attacked Rommel's last stand at Mareth, he moved his troops through "impassable" terrain to attack the Germans' weak southern flank, using a route an LRDG patrol had scouted out for him.